So how does this work? You provide the formula all of the information it needs: your shoe size and your birth year. There’s no magic involved. The numbers are just manipulated a little to get them in the right place values. Let’s break this down to show the basic steps in this algebra problem. By the end of step 5, what you have is the shoe size multiplied by 100. This takes the shoe size provided in step one and moves it two place values to the left. If your shoe size was 11, it is now represented as 1100. Added to this is 2015. (Gasp! The current year!) To find a person’s age, all we must do is subtract their birth year, which we do in step 6. This trick has some limitations that are worth noting. First, it only works with two-digit ages. 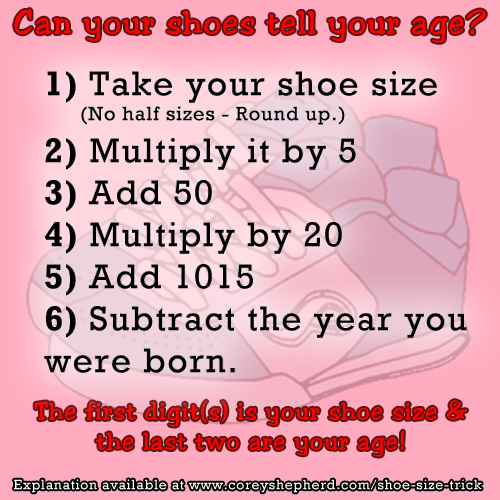 With medical technology progressing as it is, we may one day have centenarians solving silly shoe size math tricks, but right now, I’d venture a guess that it is highly uncommon. The other big limitation is that this formula will only produce the correct two-digit age if the person has already celebrated their birthday that year. Since it is January when I am writing this, the above formula will only work for those who have already celebrated their birthdays in 2015. If you are presenting this problem to someone whom you know has not yet celebrated their birthday, simply substitute “Add 1014” in step 4. This will produce the correct age in the final number. Note for teachers: This could be a fun activity to try with your students. Print two versions (one with step 4 ending in the two digits of the current year and one with the year before). Distribute to students based on if they have already celebrated their birthday or not. Let them solve with their own numbers then break into pairs or small groups to try and derive the formula as above. This is an excellent activity for basic algebra as you must combine like terms, represent multiple unknowns with symbols, and apply the distributive property. It employs higher order thinking skills to extrapolate the formula, and there are multiple opportunities to provide scaffolding to students.